On your Golden Triangle Tour With Ranthambore you will explore rich and cultural Indian heritage sites and have a wildlife experience at the famous Ranthambore national park. 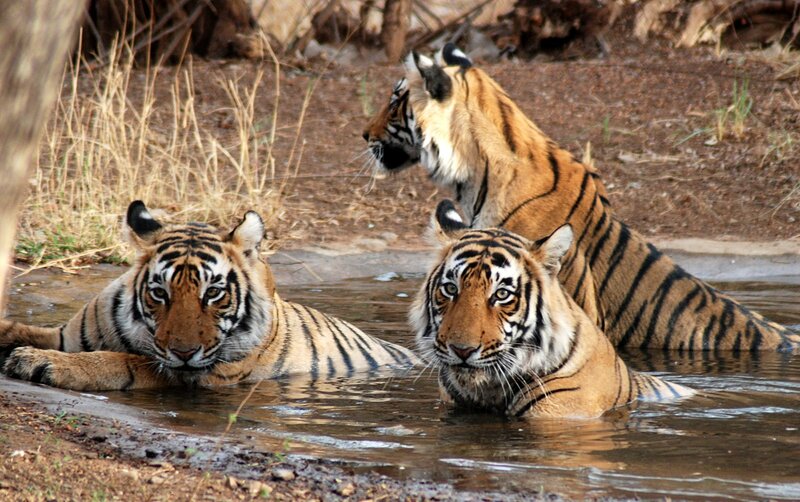 Your Golden Triangle Tour with Ranthambore will begin from Delhi. Our agency representative will be ready at Delhi’s airport to greet you upon your arrival and take to a Delhi’s suitable hotel for night’s stay. Your assigned local tour guide will meet you on next day morning and give you shortly description of you your itinerary followed by sightseeing of some of famous Delhi’s sites that includes India Gate, Lal Qila – The Red Fort, Qutub Minar – India’s largest standing stone tower, Raj Ghat – Mahatma Gandhi memorial site, Akshardham – one of city’s largest and oldest temple. Also visit The Lotus Temple and experience a moment of piece there with total silence. Later in the evening get ready to travel to your next destination Agra – the famous city of Taj Mahal, which is located at a ride of three and half hours form city. For all tour travel needs you will be provided with a well experienced driver and well maintained car for your comfort and safety. As you arrive Agra on the second day evening of your Golden Triangle Tour With Ranthambore you will be taken straight to a hotel for dinner and night’s stay. On next day morning you will meet your local tour guide and begin your Taj Mahal tour. Taj Mahal was built by Shah Jahan in the 17th century in memory of his beloved queen. It took almost 22 years and thousands of laborers to built this giant structure of white marble. It attracts tourist from all over the world for his magnificent beauty, people also recognizes it a s symbol of love. On next day take a tour of Agra Fort and many of its city delights. Also indulge yourself into some local shopping for many handcraft items. After a well guided tour of Agra proceed for your next tourist destination Jaipur – famously known as ‘Pink City’. Jaipur attracts tourist for its well preserved various palaces and forts. There are many tourist sites for you to enjoy, you will start with Amber Fort where in addition to visiting a great historical forts you will also enjoy Elephant ride there. Later visit to other sites like City Palace, Hawa Mahal – The Palace of Winds, and Jantar Mantar – an astronomical building used by Indian during medieval times to calculate the position of stars. Also visit Fathepur Sikri, later prepare yourself for some adventure as you visit your final tour destination Ranthambore national park. You would have made so many beautiful memories by the time you arrive your final destination of your Golden Triangle Tour With Ranthambore. Have some traditional breakfast before heading for a wildlife experience. Explore the rich Flora and Fauna of the Ranthambore National Park, get a glimpse of Royal Bengal Tiger here with many other local and rare animals. Head back to Delhi after having a jungle expedition at Ranthambore to carry onwards with your journey. By goldentriangleindiatrip in Uncategorized on September 24, 2014 .